It finally happened the Supreme Court has now eliminated all connections between people and their supposed government at all levels of this society. 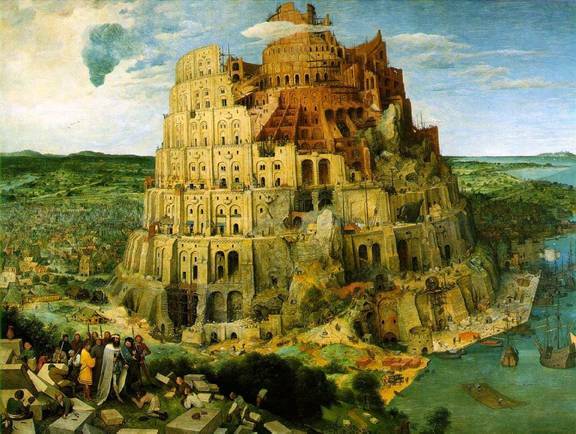 What it means is that the ancient Tower of Babel has taken over from anything like a real society. This was done by simply flooding the political marketplace with vast sums from the stolen political coffers of the most corrupt Rogue Corporations in the long history of unchecked capitalism. This wanton and criminal "ACT" by five certifiable traitors on the Supreme Court has actually eliminated any and all need for any government, at any level whatsoever! Since none of these people need to listen to the voices of the people that supposedly elected them, then officially they are no longer needed and their positions should immediately be eliminated. "By any fair legal definition, the decision yesterday by The Supreme Court 5 constitutes nothing less than an act of TREASON against the people of the United States. Having read and analyzed the entire 183 page decision and all of its concurring and dissenting opinions ourselves, we are fully prepared to support this accusatory conclusion. Having so grossly abused its jurisdiction by presuming to decide a question expressly WAIVED by the petitioner in the Court below (p.12), this rogue Supreme Court ruled for the FIRST time that NO corporation can be constrained from unlimited influence over our elections. And even assuming that the Court intended the decision to only apply to American corporations, the Court expressly DECLINED (pp. 46-47) to reach the question of whether foreign ownership stakes in American corporations should likewise be given carte blanche to put their thumbs on the scales of our democracy. Thus, until Congress FURTHER acts (and it must, though it could not have escaped the attention of The Supreme Court 5 that the current Republican minority has vowed to obstruct ANYTHING of consequence that Congress might try to pass), there is now nothing to constrain foreign nationals, even our most sworn enemies, from usurping what even the most die hard Tea Bagger takes as an article of faith, that the rights of citizenship of this country are ONLY for Americans. This must be construed, within the four corners of our Constitution, as deliberately and knowingly exposing the United States of America to harm in the interim, by giving "aid and comfort" to our enemies (Constitution Article 3, section 3), should our enemies now wish to take advantage of this unprecedented and rash decision. In simple constitutional terms . . . treason!! The fact is that we now live in a world of giant transnational corporations, with allegiance to NO sovereign government, let alone our own, sworn only to exploit the most vulnerable and desperate workers they can find in any country of the world. How does The Supreme Court 5 propose parsing which of these extra-national legal artificialities should be allowed to corrupt our democratic election process? Apparently in their minds, all of them." For those that might not understand the subtleties involved in this illegal ruling by the court: All you have to understand is that there will no longer be any political office or appointed position that will exist in opposition to any major-corporate interest, on any level from dog-catcher to resident dictator. This includes senators, and representatives, all those associated with the courts system at any level, and of course all of the now unnecessary departments of the City, County, State or Federal governments. This also means that there can no longer be any reason for taxes, fines, levies, use-taxes or fees of any kind to be collected-to be paid to this band of outlaws; because the basis for everything depended upon having a government of the people, by the people as well as for the people. That antique view has been trashed by the US Supreme Court, which nullifies all such agreements in the compact that existed between the people and their government: Because all that remains of our Republic now is government by privatized-corporate ownership of every person as well as everyone in every office at every level, that must be pleasing to the various corporations, who have just been licensed to own outright what was once the Republic of the United States. Of course the new corporate owners will violently disagree with this interpretation; but that is really not our concern any longer. Either we are Americans living under the clear and applicable laws of the US Constitution; or we are nothing but a bunch of property living under a number of corporate charters (As signified by the backward American flag, surrounded by the gold fringe on US uniforms and on display in every courtroom in this land). If the latter is true then that newly appointed group of owners has yet to make themselves known publicly; but whatever they say must be seen for the treason and the treachery that brought them into existence in the first place. IF those five members of the US Supreme Court are not arrested, tried and shot for high-treason against the United States and its constitution; then the new owners will leave everything as it is and pretend that nothing has changed. Yet everything has changed from credit-card charges to ownership of your supposed home or property: From what you're allowed to keep by way of what you supposedly earn to what you will be allowed to buy. And everything will be subject to immediate change without any challenge from those directly affected by these "NEW RULES." All of this goes way beyond the nightmare described in Orwell's "1984" because in effect there are now 'NO RULES' for those in power and millions of rules for the chattel that we shall all become under this new system that bears no resemblance to what was envisioned under the US Constitution. "We" are no longer citizens in a country because we have just become expendable property of a group of faceless corporations whose only interest is their own bottom-line-regardless of the cost in human life, in property or in long term damage to the human race. So the really good news is that there is no longer any legal authority that can require the paying of taxes; nor is there any authority to continue to hold all those totally bogus selections that masquerade as elections. Of course the price of all these drastic and malevolent changes to the way that people must now try to live will far outweigh any real benefit that might ever be gained, from the end of our criminal and formal taxation policies. The irony of course in all of this, is that again the bastards have over-reached, and now they've actually eliminated all those positions that they worked so hard to steal over so many decades and generations. But, since in Amerika, "Instant-gratification takes too long" perhaps that's understandable, if you look at it from their pathetic position which is supported only by greed and a lust for power that is obscene upon its face. Maybe this blatant act alone might be enough to wake the sleep-walking dead which this nation has continued to emulate for far too long. If not then this is the final curtain in the Endgame that was designed to do exactly what the US Supreme Court just formally did last Thursday! Good night and Good Luck Amerika, you're going to need it!